Tolumonas auensis Fischer-Romero et al. 1996 is currently the only validly named species of the genus Tolumonas in the family Aeromonadaceae. The strain is of interest because of its ability to produce toluene from phenylalanine and other phenyl precursors, as well as phenol from tyrosine. This is of interest because toluene is normally considered to be a tracer of anthropogenic pollution in lakes, but T. auensis represents a biogenic source of toluene. Other than Aeromonas hydrophila subsp. hydrophila, T. auensis strain TA 4T is the only other member in the family Aeromonadaceae with a completely sequenced type-strain genome. The 3,471,292 bp chromosome with a total of 3,288 protein-coding and 116 RNA genes was sequenced as part of the DOE Joint Genome Institute Program JBEI 2008. Strain TA 4T (= DSM 9187) is the type strain of the species Tolumonas auensis , which is the type species of the monotypic genus Tolumonas [1,2]. ‘Tolumonas osonensis’, isolated from anoxic fresh sediment, was recently proposed as the second species of the genus . ‘T. osonensis’ does not produce toluene from phenylalanine or other aromatic substrates . The genus name is derived from the Neo-Latin words toluolum, toluene, and monas, unit, meaning toluene-producing unit. The species epithet originated from the Latin auensis, of Lake Au. Strain TA 4T was originally isolated from anoxic sediments of Lake Au (a separate part of Lake Zurich), Switzerland . Four more strains (TA 1-3 and TA5) were also isolated from this source, but these strains were not able to produce toluene . Here we present a summary classification and a set of features for T. auensis TA 4T, together with the description of the complete genomic sequencing and annotation. A representative genomic 16S rRNA sequence of T. auensis TA 4T was compared using NCBI BLAST  under default settings (e.g., considering only the high-scoring segment pairs (HSPs) from the best 250 hits) with the most recent release of the Greengenes database  and the relative frequencies of taxa and keywords (reduced to their stem ) were determined, weighted by BLAST scores. The most frequently occurring genera were Yersinia (72.3%), Escherichia (8.0%), Tolumonas (7.2%), Cronobacter (6.3%) and Enterobacter (3.6%) (219 hits in total). Regarding the ten hits to sequences from members of the species, the average identity within HSPs was 99.3%, whereas the average coverage by HSPs was 98.5%. 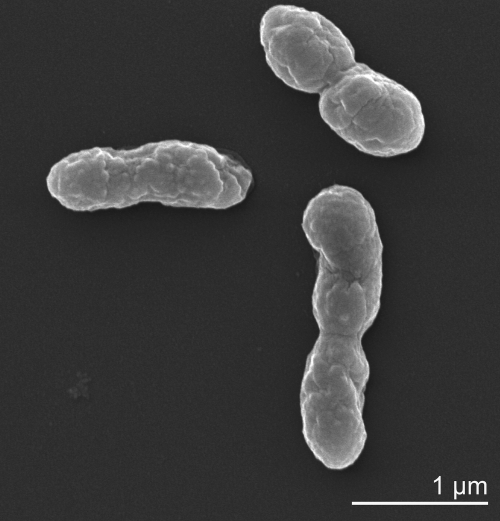 Among all other species, the one yielding the highest score was Cronobacter sakazakii (NC_009778), which corresponded to an identity of 91.8% and an HSP coverage of 100.0%. (Note that the Greengenes database uses the INSDC (= EMBL/NCBI/DDBJ) annotation, which is not an authoritative source for nomenclature or classification.) The highest-scoring environmental sequence was GQ479961 ('changes during treated process sewage wastewater treatment plant clone BXHA2'), which showed an identity of 99.2% and an HSP coverage of 97.9%. The most frequently occurring keywords within the labels of environmental samples which yielded hits were 'reduc' (7.7%), 'sludg' (5.6%), 'activ' (4.8%), 'treatment, wastewat' (4.2%) and 'comamonadacea' (4.1%) (31 hits in total). The most frequently occurring keywords within the labels of environmental samples which yielded hits of a higher score than the highest scoring species were 'reduc' (7.9%), 'sludg' (5.3%), 'activ' (5.0%), 'treatment, wastewat' (4.3%) and 'comamonadacea' (4.3%) (27 hits in total). These keywords fit reasonably well to the ecological properties reported for strain TA 4T in the original description . Figure 1 shows the phylogenetic neighborhood of T. auensis in a 16S rRNA-based tree. The sequences of the eight 16S rRNA gene copies in the genome differ from each other by up to 29 nucleotides, and differ by up to 19 nucleotides from the previously published 16S rRNA sequence (X92889), which contains eight ambiguous base calls. 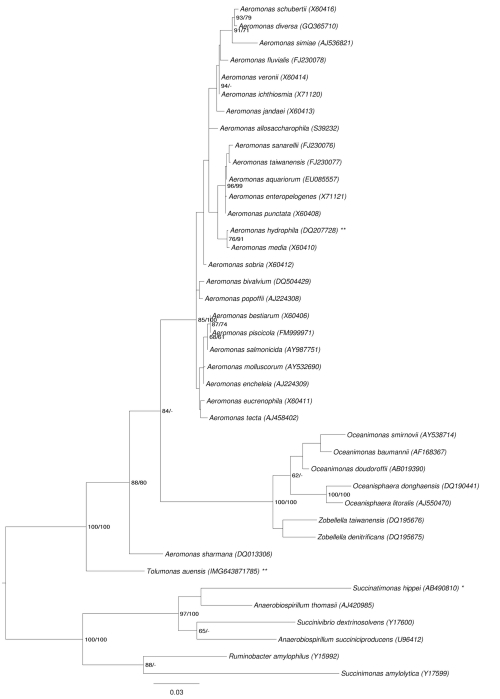 Phylogenetic tree highlighting the position of T. auensis relative to the type strains of the other species within the family Aeromonadaceae. 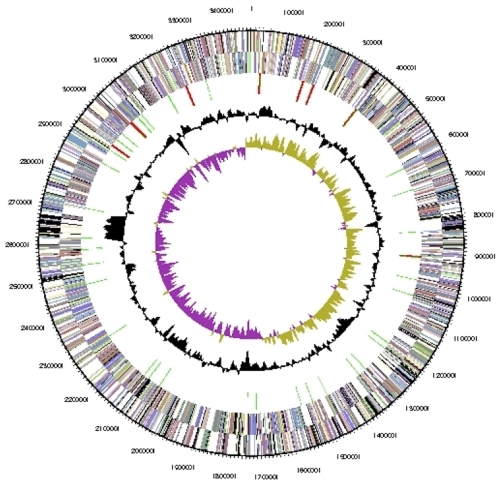 The tree was inferred from 1,462 aligned characters [7,8] of the 16S rRNA gene sequence under the maximum likelihood (ML) criterion  and rooted with the neighboring family Succinivibrionaceae. The branches are scaled in terms of the expected number of substitutions per site. Numbers adjacent to the branches are support values from 1,000 ML bootstrap replicates  (left) and from 1,000 maximum parsimony bootstrap replicates  (right) if larger than 60%. Lineages with type strain genome sequencing projects registered in GOLD  are labeled with one asterisk, those also listed as 'Complete and Published' with two asterisks . Cells of T. auensis strain TA 4T are rod-shaped, 0.9–1.2 × 2.5–3.2 µm (Figure 2, Table1) and occur singly and in pairs . TA 4T cells stain Gram-negative, are non-motile, and grow equally well under oxic and anoxic conditions . Strain TA 4T grows at a pH range from 6.0 to ­7.5, and a temperature range of 12–25°C, with an optimum at 22°C . Oxidase was not produced under any of the growth conditions, whereas catalase was produced only under aerobic conditions . Substrate spectrum and biochemistry of the strain were reported in detail by Fischer-Romero et al. . Toluene production was observed under oxic and anoxic conditions, but only in the presence of phenylalanine, phenyllactate, phenylpyruvate, or phenylacetate and one of the carbon sources specified in . Phenol was produced from tyrosine . Classification and general features of T. auensis according to the MIGS recommendations  and the NamesforLife database . Data on the cell wall structure of strain TA 4T are not available. Ubiquinones and menaquinones were present under oxic and anoxic conditions, with Q-8 being the major ubiqinone and MK-8 being the major menaquinone . Under aerobic conditions a second, as yet uncharacterized menaquinone was observed . Phosphatidylglycerol and phosphatidyl-ethanolamine were the major phospholipids under both oxic and anoxic growth conditions . The major cellular fatty acids were C12:0, C14:0, C16:0, C16:1 ω7cis, C18:0, C18:1 ω7cis, as well as C14:0 3-OH. One half of the latter fatty acid was amide-bound, the other half was ester-linked as were all the other fatty acids . This organism was selected for sequencing on the basis of the DOE Joint Genome Institute Program JBEI 2008. The genome project is deposited in the Genomes OnLine Database  and the complete genome sequence is deposited in GenBank. Sequencing, finishing, and annotation were performed by the DOE Joint Genome Institute (JGI). A summary of the project information is shown in Table 2. The history of strain TA 4T begins with C. Fischer who directly deposited the strain in the DSMZ open collection, where cultures of the strain have been maintained in lyophilized form frozen in liquid nitrogen since 1994. The culture of strain TA 4T, DSM 9187, used to prepare genomic DNA (gDNA) for sequencing was only three transfers removed from the original deposit. A lyophilized sample was cultivated under anoxic conditions at 20°C using DSMZ medium 500 (with 2 g/L glucose as the primary carbon source) . Genomic DNA was isolated using the MasterPure Gram Positive DNA Purification Kit (EpiCentre MGP04100) according to the manufacturer’s instructions. The purity, quality, and size of the bulk gDNA were assessed according to DOE-JGI guidelines. The gDNA ranged in size from 20–125 kb, with most falling in the 75–100 kb range, as determined by pulsed-field gel electrophoresis. The genome was sequenced using a combination of Sanger and 454 sequencing platforms. All general aspects of library construction and sequencing can be found at the JGI website . Pyrosequencing reads were assembled using the Newbler assembler (Roche). Large Newbler contigs were broken into 3,816 overlapping fragments of 1,000 bp and entered into assembly as pseudo-reads. The sequences were assigned quality scores based on Newbler consensus q-scores with modifications to account for overlap redundancy and adjust inflated q-scores. A hybrid 454/Sanger assembly was made using the phrap assembler . Possible mis-assemblies were corrected with Dupfinisher and gaps between contigs were closed by editing in Consed, by custom primer walks from sub-clones or PCR products . A total of 764 Sanger finishing reads and four shatter libraries were needed to close gaps, to resolve repetitive regions, and to raise the quality of the finished sequence. The error rate of the completed genome sequence is less than 1 in 100,000. Together, the combination of the Sanger and 454 sequencing platforms provided 29.3 × coverage of the genome. The final assembly contained 20,349 Sanger reads and 409,035 pyrosequencing reads. Genes were identified using Prodigal  as part of the Oak Ridge National Laboratory genome annotation pipeline, followed by a round of manual curation using the JGI GenePRIMP pipeline . The predicted CDSs were translated and used to search the National Center for Biotechnology Information (NCBI) non-redundant database, UniProt, TIGRFam, Pfam, PRIAM, KEGG, COG, and InterPro databases. These data sources were combined to assert a product description for each predicted protein. Non-coding genes and miscellaneous features were predicted using tRNAscan-SE , RNAMMer , Rfam , TMHMM , and signalP . The genome consists of a 3,471,292-bp long chromosome with a 49.0% G+C content (Table 3 and Figure 3). Of the 3,288 genes predicted, 3,172 were protein-coding genes, and 116 RNAs; 42 pseudogenes were also identified. The majority of the protein-coding genes (76.5%) were assigned a putative function while the remaining ones were annotated as hypothetical proteins. The distribution of genes into COGs functional categories is presented in Table 4. The work conducted by the U.S. Department of Energy Joint Genome Institute was supported by the Office of Science of the U.S. Department of Energy under Contract No. DE-AC02-05CH11231, and work conducted by the Joint BioEnergy Institute (H.R.B.) was supported by the Office of Science, Office of Biological and Environmental Research, of the U.S. Department of Energy under Contract No. DE-AC02-05CH11231. Garrity GM, Bell JA, Lilburn T. Phylum XIV. Proteobacteria phyl. nov. In: Brenner DJ, Krieg NR, Staley JT, Garrity GM (eds), Bergey's Manual of Systematic Bacteriology, second edition, vol. 2 (The Proteobacteria), part B (The Gammaproteobacteria), Springer, New York, 2005, p. 1. Martin-Carnahan A, Joseph SW. Order XII. Aeromonadales ord. nov. In: Garrity GM, Brenner DJ, Krieg NR, Staley JT (eds), Bergey's Manual of Systematic Bacteriology, Second Edition, Volume 2, Part B, Springer, New York, 2005, p. 556.